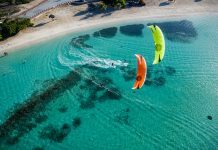 Interview with Austria’s Adrian Geislinger, Flysurfer kites and Levitaz foil team rider, currently fifth overall and climbing the overall rankings. Team mates Benni Boelli and Peter Mueller are also poised high in the points’ standings. 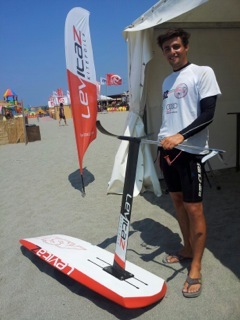 AG: I’m on the Levitaz kitefoil and 15m Sonic FR from Flysurfer. 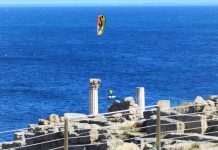 IKA: We’re on day two of the KiteFoil GoldCup. How’s it going so far? AG: It’s going really, really good. I wasn’t expecting to be in the top 10 and today the second day was better. I was finishing third and second. And yesterday I got my first bullet in a world championship event, which is a first for me. I’m really, really happy with the way it’s going. 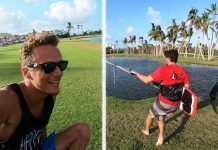 IKA: That’s quite an advance on how you were doing in [KiteFoil GoldCup] Mexico. What’s changed? AG: I changed my whole set up. I changed my kite and now with Levitaz we have the full new set up. We call it Aspect Bionic with the really, really small rear wing and a long fuselage to stabilize everything. The kite is also really good. It’s proved to work. IKA: The Levitaz foil is made by your family’s Geislinger company. AG: Yes, it’s made by Geislinger who actually make couplings and dampers out of carbon composites. But the main thing is they make things out of steel. We have a steel fuselage in the concept. One day we were thinking we have everything here: people who know about aerodynamics, we have have the carbon. We should make a foil. IKA: How long have you been doing that? AG: Last year we started to make the prototypes. Mario Legenstein was the designer. He’d been designing foils in his garage for about five years and he was always looking for an industry partner. That’s how everything came together. In April we started the website and online shop and started building up the brand. Now we have the Aspect 3 for sale. And there’s a free race wing coming. Currently we’re working on that. IKA: You will have the bigger more established foil brands looking over their shoulders now? AG: Yes, I think everyone is looking at how fast we are going. Everyone is surprised how well it works. We were surprised too. When I saw this small rear wing it looked like it would break any minute. But it’s working really well. IKA: That must be one of the most exciting things about kite foiling, how quickly it develops. AG: That’s interesting. Maybe they should make points for riders and for engineers, the way they do in Formula 1. You need a strong brand behind you and a good team. Levitaz has that with Benni Boelli (GER) and Peter Mueller (GER). We developing and testing new products all the time to see what works best; new carbon layups for the wings. That’s what I like about foiling: that it’s “open”, not so ruled like the kite board racing class.